So many TV shows are cancelled after only one season. Has the Timeless TV show been cancelled or renewed for a second season on NBC? The television vulture is watching for the latest cancellation and renewal news and this page has been created as a dedicated place to track the status of Timeless season two. You can bookmark it, or subscribe for the latest updates. Remember, the television vulture is watching your shows. Are you? Airing on the NBC television network, Timeless begins as a mysterious criminal (Goran Visnjic) steals a secret state-of-the-art time machine, intent on destroying America by changing the past. 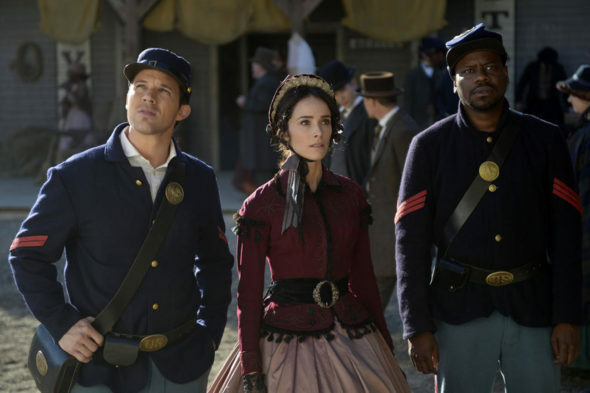 The country’s only hope is an unexpected team of a history professor (Abigail Spencer), a soldier (Matt Lanter), and a scientist (Malcolm Barrett) as they embark on the adventure of a lifetime to stop the villain. The rest of the cast includes Paterson Joseph, Sakina Jaffrey and Claudia Doumit. Season one of Timeless averaged a 1.10 rating in the 18-49 demographic with 4.62 million viewers. Find out how Timeless stacks up against the other NBC TV shows. On May 13, 2017, NBC reversed their decision to cancel Timeless and renewed it for a second season which will debut March 11, 2018. Stay tuned for updates. For whatever reason, the networks seem to be fixated on time travel this season. Fortunately for Timeless, it was the first to air. It also didn’t hurt that the peacock network scheduled it to follow their most popular series, The Voice. Timeless had a positive start. Unfortunately, the ratings have been falling quite rapidly. Though it’s been hyped as a hit, Timeless is no Blacklist. It’s also not a cheap series to produce (lots of new costumes and sets each week). Unless the numbers miraculously get better (where’s a time machine when you need it? ), I think time is short for Timeless. The television vulture has reason to watch this one closely. 5/13 update: NBC reversed their decision to cancel Timeless and renewed the series for a second season. Details here. 1/22/18 update: NBC has revealed the season two premiere date for Timeless. Details here. Read other Timeless TV series posts. Check out news about other NBC TV shows. Check out the NBC status page and other TV show status pages. What do you think? Are you glad that the Timeless TV show has been renewed for a second season? Would you have been upset if this series had stayed cancelled? Little Big Shots on NBC: Cancelled or Renewed for Season Four? Better Late Than Never: Is the NBC TV Show Cancelled or Renewed for Season Three? The Brave: Is the NBC TV Show Cancelled or Renewed for Season Two? Watched the 1st two episodes then lost all interest. Silly on so many levels. Hard to believe people actually feel they are learning history with this show. Where did they spend their high school years? I am concerned that they brought it back during “March Madness” I missed the first two episodes for this reason. Thankfully I have “on demand”. I am totally in love with the show because it is exciting, dynamic, fascinating and it is not laced with vulgar profanity. I do not spend a lot of time watching tv but this show is wonderful! It is like a history lesson with each episode! Love it! I absolutely love this show! Great actors with very interesting story lines. It is a show I can watch with my 13 and 16 year old sons. Lots of action and adventures. We are hooked. Do not cancel this show!!! I loved the show and didn’t miss an episode. Please bring it back for a second season!! Waiting patiently to see season 2. This is probably why series do t make it, you give us 8 or 10 episodes then it goes on hiatus for too long. By the time you bring back the show, we are already watching something else in it’s time slot. You’ll never learn. When is timeless coming back on? Can’t wait to see season 2. This show is awesome ! Learning about history , a good plot ! Give it a real chance and put ut on prime hour !